Saturday, May 10, 2014, 9:00 a.m.: Mount Lowe, Angeles National Forest (Five-Way Junction near Inspiration Point): The walk follows the Mt. Lowe fire road from near Eaton Saddle to the Five-Way Junction near Mt. Lowe, and returns up and over Mt. Lowe itself, for a total of 6 miles. An easier return walk can be taken. 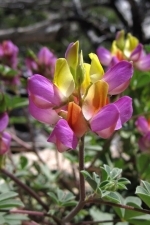 Plants that we may see include harlequin lupine, mountain clarkia, urn-flowered alum root, Bolander's woodland star, and many more. Leaders John Thompson and Jane Tirrell — thrushless(at)gmail(dot)com and jgtirrell(at)gmail(dot)com. The hike requires at least four hours, possibly more, — six miles of botanizing at a maximum pace of a mile and a half per hour. Bring lunch and plenty of water: no water available along the trail. The route has some shade, but is mostly exposed to the sun. Last restrooms are at Red Box. Parking at Red Box requires an Adventure Pass, but our “Markham Trailhead” is designated as free. Hiking grade is easy on the 3-mile fire road, through a few sections of this disused road are uneven and boulder-strewn. Staying on the road round-trip will entail 1,050-ft elevation gain/loss. The optional return over the top of Mt. Lowe isn't long, but should be regarded as strenuous, on a decent but not luxurious trail (hiking poles recommended); this route would entail an additional 300-ft gain/loss. Directions: Meet 9:00 a.m. at Eaton Saddle, which is approximately 2.3 miles beyond Red Box on the Red Box to Mt. Wilson road. Red Box is itself about 12 miles up the Angeles Crest Highway from La Cañada Flintridge. Parking should not be a problem if you arrive by 9 a.m.
Further information: For a (printable) map showing this hike, click here. For a plant list of the area, showing what we actually observed, click here.